In Part 1 of analysing the „Star Trek: The Next Generation“ transcripts, I performed some statistical analysis of the characters and episodes: who has the most lines and appears in which episodes, etc. In my new Ipython notebook I concentrated on the text itself. This was actually my first motivation to work with the Star Trek: The Next Generation transcripts from chakoteya.net: I wanted to try out some machine learning algorithms. I came up with the idea to predict which STNG character is the speaker of a text-line or just any word. „My calculations are correct“ is ascribed to Data with 78% probability. And who would use the word „Mom“? Obviously Wesley with 88% probability. Where instead „Mother“ is a word used by Deanna Troi with 60% probability. But have a look for yourself. To do all this, there where some steps included, which have been a real good practice in python, numpy, pandas and sklearn. I had to download and clean the data, which was a good practice in startrekng-episodes-analysis_01.ipynb. 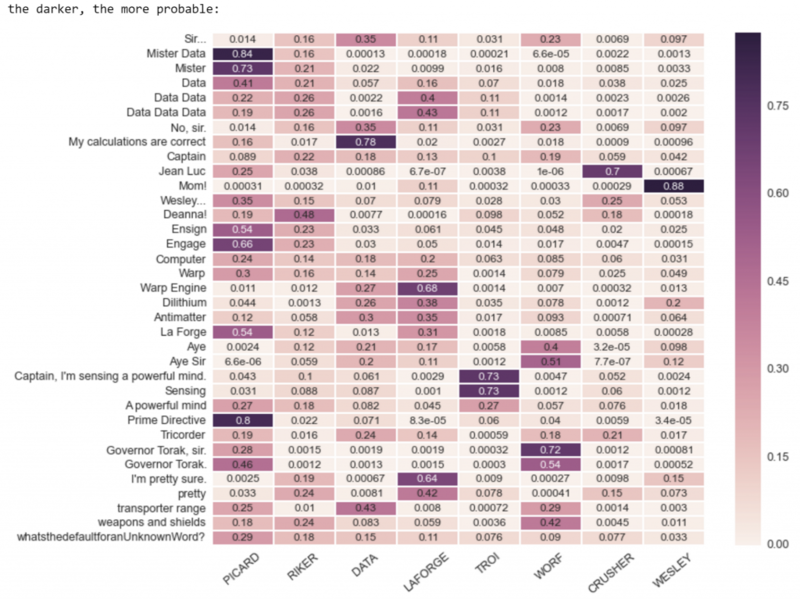 I did some statistical analysis of dataset with python, numpy and pandas in startrekng-episodes-analysis_02.ipynb. To do all this, I learned a lot from the „pandas“-book and from the scikit-learn-examples like the MLComp-text-classification. And obviously almost nothing could have been done without stackoverflow. If anyone is interested in the foundation of the algorithms, I recommend the coursera MOOC „Probabilistic Graphical Models“ by Stanford Professor Daphne Koller and the „Natural Language Processing“ course by Dan Jurafsky and Christopher Manning. Also the udacity course about Machine Learning is pretty helpful.